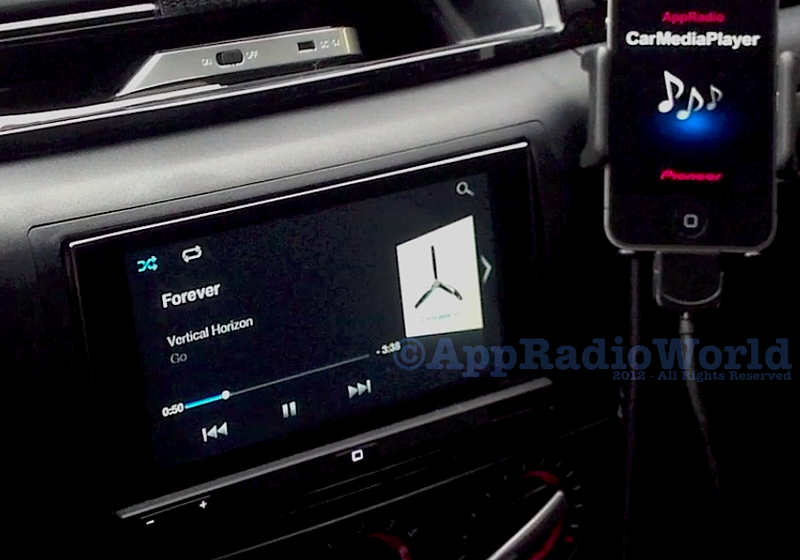 AppRadio users have been subject to a very hard-to-use iPod app interface since launch. But with the recent release of the iOS app, CarMediaPlayer, Pioneer seems to have addressed the issue. For those of you who don't know, CarMediaPlayer is a separate app from Pioneer that is an alternative to the stock iPod app on the AppRadio. The main difference being the ability to use swipe to scroll which has been missing all this while. But CarMediaPlayer isn't perfect. Here is one issue that bugs the app. As you will see in the video below, the process of changing tracks in CarMediaPlayer isn't streamlined. Every new track starts with a stutter. In other words, the track starts playing and less than a second into it starts over. You can imagine how annoying this can be. Try easing into your drive with music that stutters. Ain't gonna happen! This is obviously a software issue which will hopefully be fixed with an update. For now I'll stick to the stock iPod app. Confirms that androids can be mounted somewhere else... We don't need to switch apps using phone... Take that Apple!!!... That is if they ever release it. Looks like an MHL connection just mirrors AppRadio's display onto the phone. Strange. k first off, all the Apps that run on AppRadio are running on the iPhone. They are merely being displayed and controlled from the AppRadio. This is necessary because the display on the phone and the display on appradio are not the same, and not all apps support landscape view or if they do (pandora) they don't have full functionality. Also these car apps are nicely formatted to the display. Second off the iPhone supports having the display mirrored if you jailbreak it, which I have. They haven't figured out how to control the mirroring, but I can do it. Not much use since I can already watch videos stock on the device, and the only apps I want to use on it are nav and music apps which are 90% supported out of the ones I use. Third you don't need to have the phone next to the appradio with the exception of motionx and pandora, and only pandora because it doesn't load the appradio app when you press the home button. All the other apps I use load AppRadio when you press home which from there you can switch to another app. I like having the phone next to the appradio for other reasons that i'll explain but I don't need to. Finally not mirroring has it's advantages as well. For example, motionX puts key controls on the iPhone while leaving the map display clean and gorgeous. If you have your iphone mounted next to the app radio, it makes for a fine dual screen setup for your car. Also thanks to a wonderful glitch pandora lets any other app run at the same time as it, so I run it and waze at the same time since waze isn't supported by app radio yet. Multitasking at it's finest. No stuttering on my appradio - works a treat! mine only stutters once if you closed the app before loading it back up and it won't load the track where you last left it. Besides that I'm golden. I also have the stuttering problem, and it is quite annoying. However, I'm most frustrated by the issue with the latest firmware update which now requires the hand brake to be applied in order to use _any_ of the App functionality. Since that firmware update, I've been unable to use any of the apps while driving (GPS, traffic, MediaPlayer, etc.). For me, that update was a huge step backwards. What good is voice navigation if it's only functional while stopped with the hand brake applied? I found out how to bypass it. Just quit the apps before you load them for the first time in the car and they all bypass that without a problem. Hope that helps. hmmm... I haven't updated my firmware yet, recommend? is there any reason to actually upgrade it?